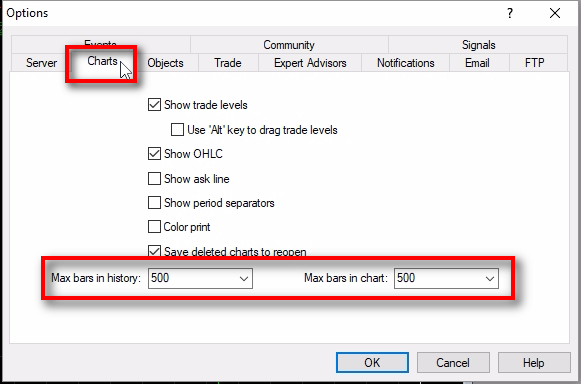 In this tutorial, Rimantas explains how to make the MetaTrader 4 show more price bars and candles on the charts. We’ll need to increase the number of bars in the chart to expend MT4 chart history. 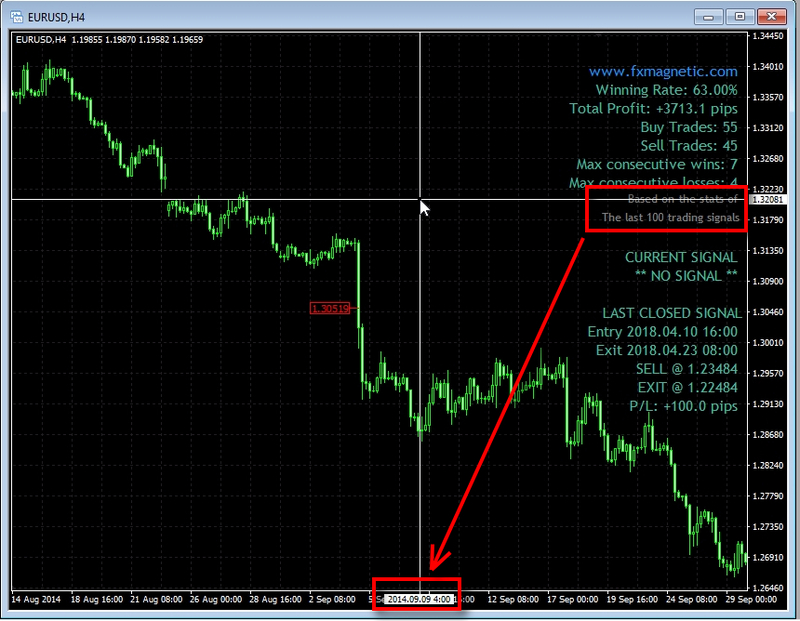 It is required when you want MT4 custom indicators to display more entry signals. The process is straightforward and takes only about a minute to implement. How many trading signals does your indicator display on the chart? For this example, I use FxMagnetic custom indicator, but this method applies to any MT4 indicator. If you do not see last 100 trading signals, it means your MT4 does not have enough price bars and candles on the chart. All indicators use historical prices for the algorithm to calculate entry signals, etc. If there’s not enough historical data, the indicator cannot display entry signals at all, or in most cases, show too few entry signals. It leads to another problem – inaccurate stats (Winning Rate, Total Profit, etc.). Inaccurate stats occur because there is not enough data for statistical significance. Think of a car gasoline consumption. To know how much gasoline any car consumes we need to drive at least 100 km to get accurate numbers. Some say that 100 trading signals are too much for stats calculation, others say it is too few, but we think 100 is fair enough. Now, let’s make the MT4 display more trading signals. To do this, we need to configure MT4 to show more price bars and candles on the charts, which is done in 2 steps. 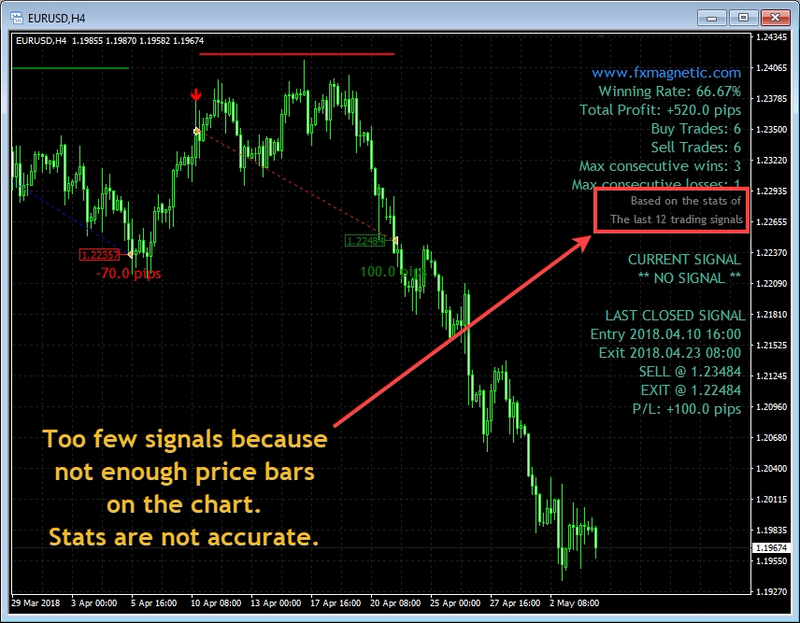 Step 1 is to set max bar count in MT4 to a maximum possible number. Step 2 is to make sure MT4 downloads all the price bar history data from the broker. 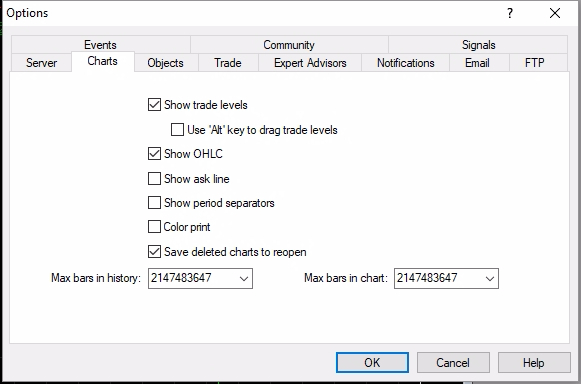 Click on “Options Ctrl+O” menu in the Tools at the top of MT4. In the Options window, click on “Charts” tab. For this example, I have them set to 500 on purpose, but many MT4 platforms usually have this number too small as well. We will set this to the maximum possible number so that there was no limit on the number of price bars to display. Set the bar count to ten nines (9999999999) and then click on “OK” button. Note that you need to set the number for both parameters like you see in the picture. After you save changes, go back to the Charts section. You should see max bar count set to 2147483647. It is the maximum possible bar count on MT4 (which is way too much than we need actually). So the trick to using ten nines (9999999999) was because it is easier to remember it than this number we saw in the image. Anyway, the first step is complete, and you can close this window now and restart MT4 platform. 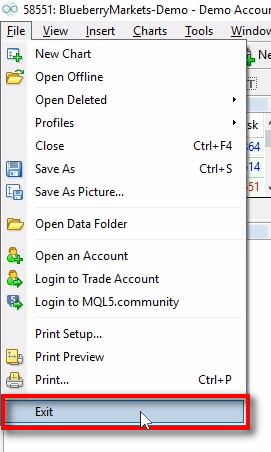 To restart MT4, you need to click on “Exit” in the File section of the top menu. First, you need to make sure that the correct chart is selected. Find the chart where you have the indicator attached and then click anywhere on it. This way we make sure the chart is selected and ready for the bar download procedure. Then, you need to turn off the “Auto Scroll” mode temporary for the chart. We will turn it on later because it is more convenient when the chart is in “auto scroll” mode. Click the “Auto Scroll” button in the top toolbar so that it stays in the “unchecked” mode. Right-click on the chart and choose “Properties” from the menu. 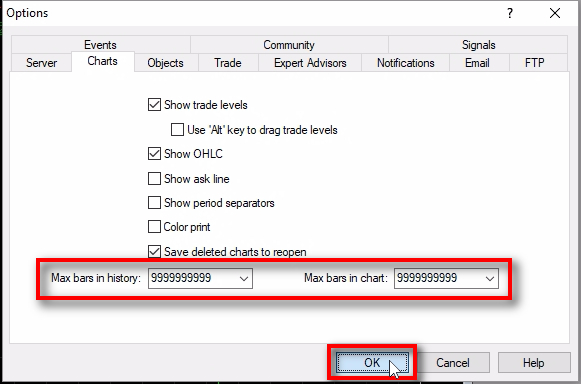 In the chart Properties window, open the “Common” tab and then make sure that the “Chart auto scroll” is unchecked. When you download more historical data you want to download it from your broker, not the MetaQuotes server. 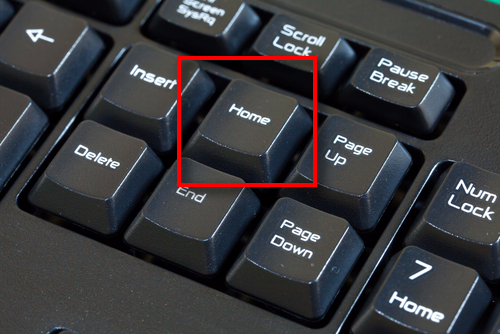 Press and hold the HOME button on the keyboard to download history data from your broker server. Be patient. Sometimes it takes around 15-30 seconds, other times it might take up to 1 minute. It means you’ll have to hold the HOME key for about 1 minute or until you’ll see FxMagnetic already display last 100 trading signals. Usually, the smaller the timeframe, the longer it takes to download the price bars from your broker. But you should start seeing changes on the chart in the first few seconds after you press and hold the HOME button. Note that when MT4 downloads more and more price candles the FxMagnetic might repaint oldest entries several times. Repainting will stop when you download enough data to show the last 100 trading signals. 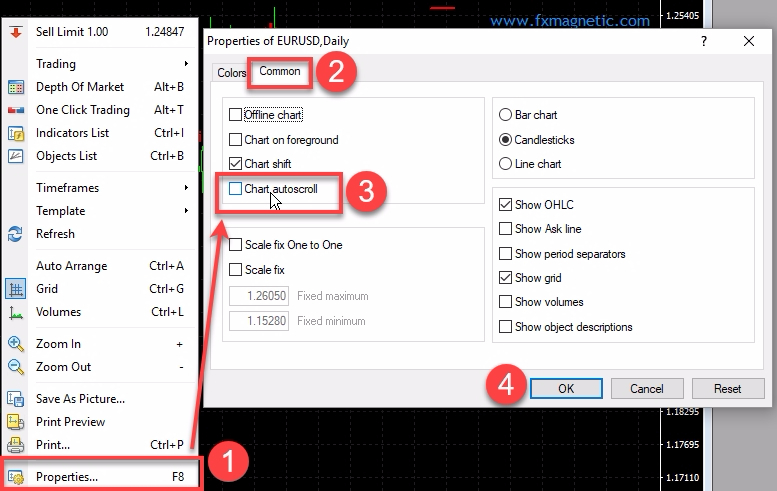 On the right side of the chart, FxMagnetic shows how many signals it is displaying and using for stats calculation. When you see it gets “stuck” at 100 it means you can release the HOME button and the price history download is completed. For this particular MT4, we had to download the price bars way back to until September of 2014. We could download more, but it is not necessary because FxMagnetic will show only 100 Forex signals. Is important to understand, that price bars are different for each broker which means FxMagnetic will display slightly different stats and entry signals. For time frames H1 and lower the differences should be minimal. But for time frames H4, Daily and above, the differences might be huge. It usually happens because of a different timezone. The indicator is optimized on FxOpen ECN Live account, its price bars, and its timezone which is GMT+2 with a DST (US standard). If your broker uses another timezone, it means Daily and H4 bars start forming at a different hour, and for this reason, they look different. When price bars are different, all calculations for the algorithm provide different results.